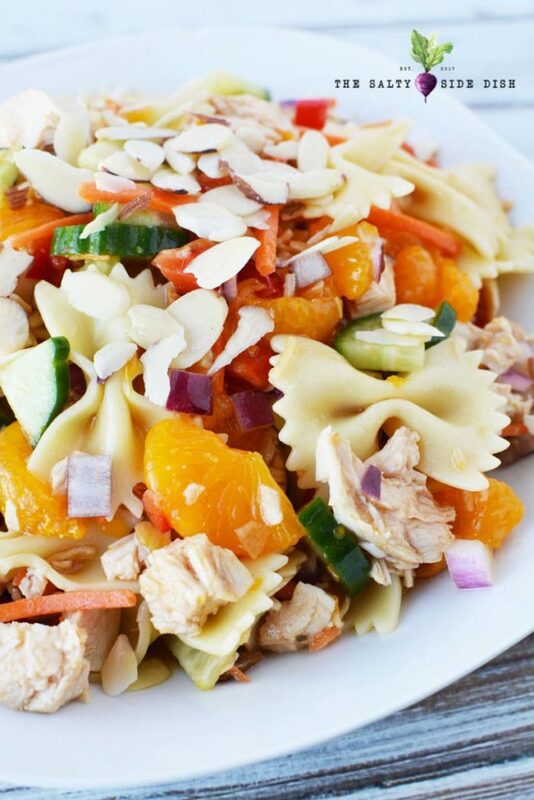 Mandarin chicken salad with tiny and sweet mandarin oranges and just the right amount of bow tie pasta, is a great spring salad full of flavor and textures. With a perfect delicious dressing and tiny slivers of almonds that bring an end crunch, you cannot go wrong with this salad at this years BBQ. I love salads year round. While Caesar salads and loads of ranch dressing can be traditional, mixing up your meals with unique side dish options like Quinoa Black Bean Salad, Southwest Couscous salad or a sweet and creamy classic macaroni salad is just the ticket to an unforgettable BBQ, picnic, or holiday dish that makes everyone want your recipe. No sense in making the same old tomatoes and lettuce salad. I mean those are good, do not get me wrong, but when you combine fruit and veggies MAGIC happens! Aside from this mandarin salad, I also personally adore the whole apple/cheese/cranberry combo. Perfect, right? 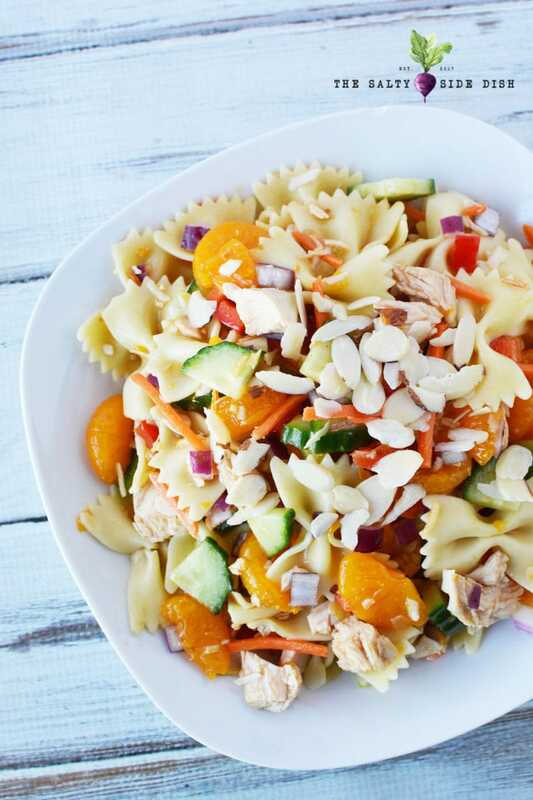 This particular recipe has sliced almonds for the finishing touch, but feel free to replace with peanuts or cashews, both which are high in flavor and texture and take nothing away from this salad dish. Skip Wendy’s and make your own orange salad right from home, complete with left overs for tomorrow! A little on the sweet side and a lot on the flavor side, this salad is perfect to feed a crowd or simply to spice up your boring old lunch plate. Servings: This made about 6-8 cups and I’d say that you’d eat a 1/2 to 1 cup serving. 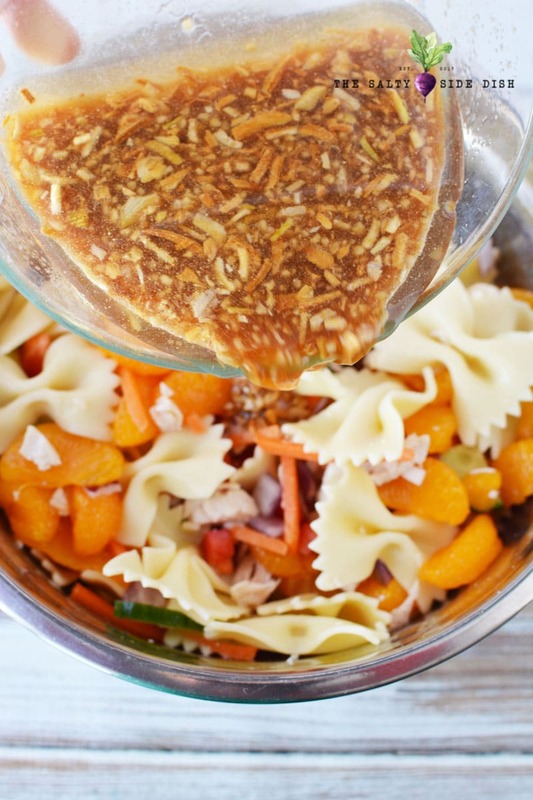 The dressing recipe to this mandarin salad is below. You use the actual juice from the oranges, so do not get trigger happy and dump it out before reading (or printing) the entire recipe. I personally combine all the juice and flavors in a bowl and let set to prep the rest of the dish, but you could also add all these ingredients to a mason jar so if you have extra you can store easily. Drain mandarin oranges to measure 1/4 cup juice. Pour the juice into a small mixing bowl. Set the actual oranges aside. In the smaller bowl with the orange juice, add ginger, vinegar, oil, onion soup mix, minced garlic and sugar. Mix well and let set for 30 minutes. Stir the dressing occasionally (maybe once every 10 minutes) so the ingredients don’t settle too much. 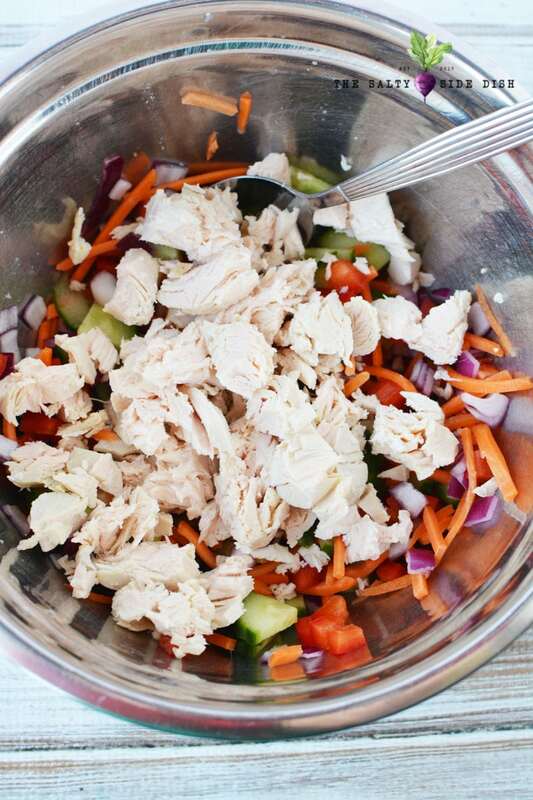 Add all your sliced veggies – cucumber, bell pepper, onion, carrots, chicken and drained oranges to a mixing bowl. Mix all ingredients really well. Pour prepped dressing over pasta and mix well to evenly coat. Serve your mandarin salad immediately or you can also refrigerate, covered, until ready to serve. If you choose to put in fridge, make sure you mix again prior to serving. 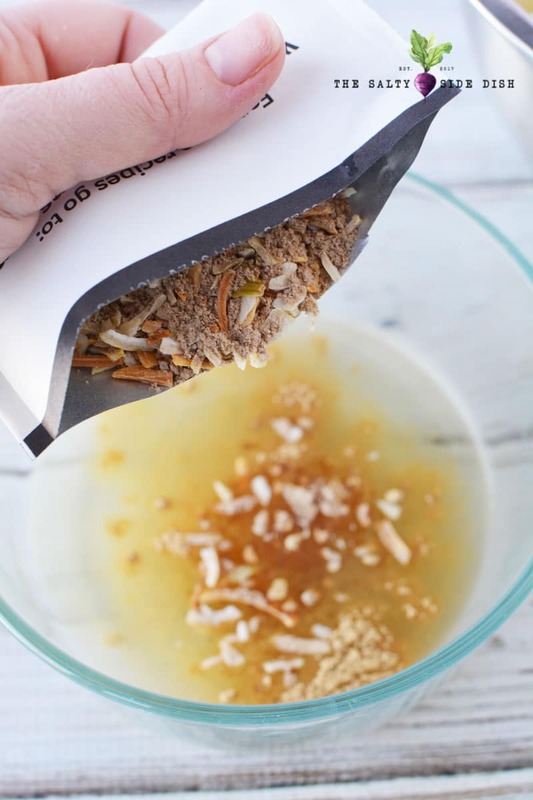 Top with sliced almonds right before putting out or directly on your serving so they do not get soft. Additionally if you need some color, you can add a bit of avocado or sliced green onions. Personally I like to print my recipes for store ingredients and usage in the kitchen so I am not touching my phone while cooking. 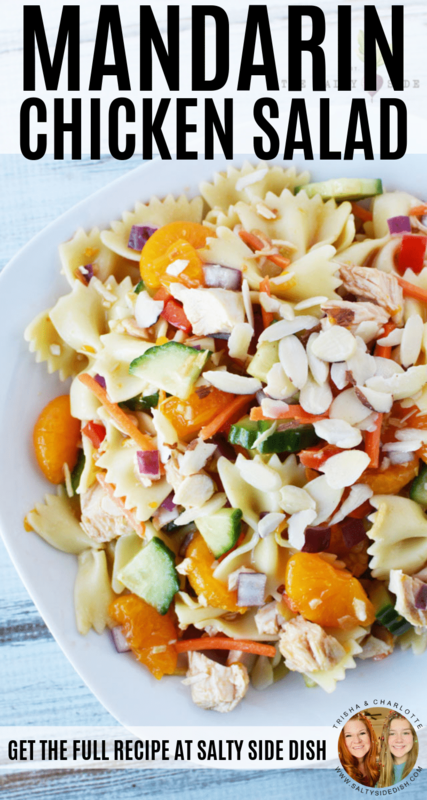 Mandarin chicken salad with tiny and sweet mandarin oranges and just the right amount of bow tie pasta, is a great spring salad full of flavor and textures. Drain mandarin oranges to measure 1/4 cup juice. 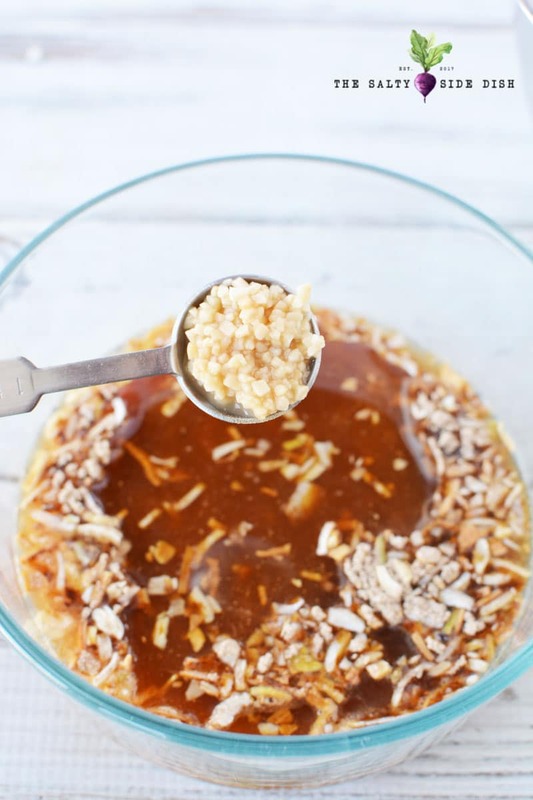 Pour into a small mixing bowl. Discard remaining juice from can of oranges. Set oranges aside. In the smaller bowl with the orange juice, add ginger, vinegar, oil, onion soup mix, minced garlic and sugar. Mix well and let set for 30 minutes. Stirring occasionally. This looks so refreshing and full of flavor! Love all the flavors and colors in it. The mandarins make it extra special. 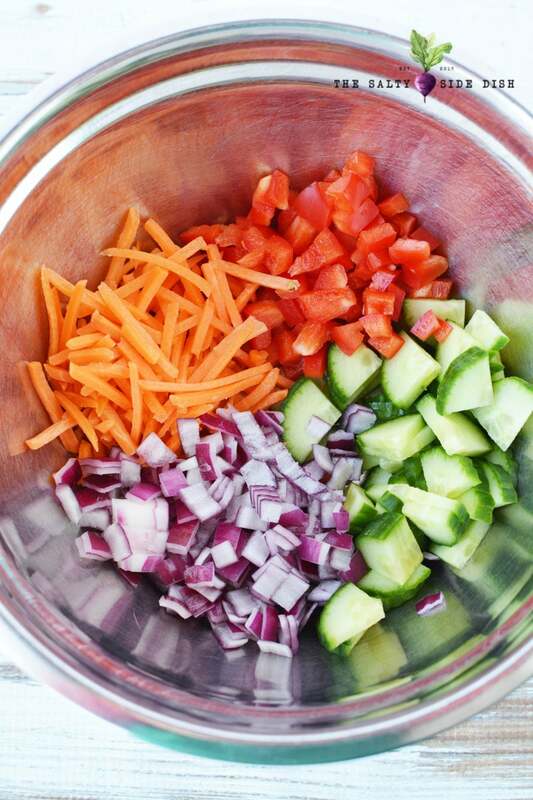 I’d love to have a big bowl of this in my fridge right now!